Our philosophy is that you don’t need a different product for every skin part; who wants to haul all those jars and tubes around anyway? That’s why we designed our all purpose cream to work for every part, from chapped earlobes to cracked heels and everything in between. If you’re looking for our all-purpose cream, but without essential oils, please try our Naked All Purpose Cream. Ingredients: Calendula, chamomile, comfrey, & lavender in safflower oil; distilled water; beeswax; coconut oil; glycerine; aloe butter; Vitamin E; essential oils; rosemary extract. Calendula, Chamomile, Lavender, & Comfrey: Known for their healing, soothing, & calming properties. Vitamin E: An antioxidant that has been trusted in skin care products for centuries to speed healing & reduce scarring. Coconut Oil: Easy for skin to absorb, keeps the deepest skin layers strong and supple. Glycerin: Attracts water to keep skin moisturized & nourished and aids in cell metabolism. Rosemary Extract: Extends shelf life, naturally. Uses: Face, hands, knees, calloused feet, sunburns, leather boots, eyebrows, shins, earlobes, lips, bug bites, diaper rashes, scratches, and scrapes. 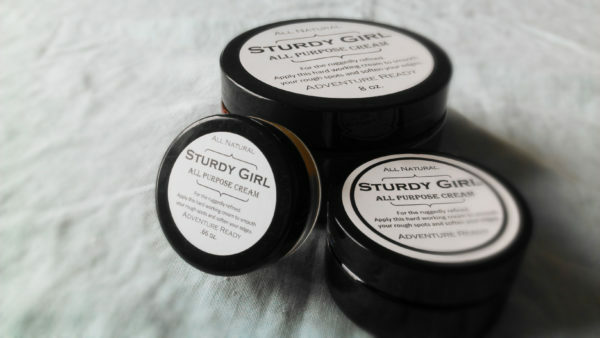 I was introduced to Sturdy-Girl all-purpose cream by a friend. I work in healthcare and wash or alcohol gel my hands constantly! And on top of that I have eczema. I love it for my skin. But my new favorite use is as a hair conditioner! I wash my hair with Castile soap and had been researching all natural (DIY) hair conditioners. Ingredients that kept popping up were glycerine, olive oil and coconut oil. Since all of those are in the hand salve I decided to give it a whirl. A little goes a long way. I have naturally curly hair and I LOVE how it doesn’t weigh my hair down. It helps contain my dry, frizzy curls and gives my hair some shine to boot! It truly is an “all-purpose” cream! Thanks so much! 4 oz jar as a gift. I had never heard of it. I saw it contained calendula which is in some products that are recommended for patients on chemo who get very dry skin. I have naturally very dry skin. It is fantastic! I use a small amount everyday on my arms, legs and feet. The healing and softness it promotes is near miraculous! Thank you for your comment, Pam! We’re so glad to hear that it’s helped you! I purchase some of the All-Purpose in Bozeman just because I liked the scent. Little did I know how much I would LOVE it, I realized that a little goes a long way and I loved carrying it with me while backpacking. I totally loved it and recently started using it on my lips every now and then. Works wonders!